Originally conceived in 1968, Toronto’s CN Tower was constructed between 1973 and 1976. For 34 years, it stood as the world’s tallest free-standing structure and largest tower. In 1995, it was declared one of the modern Seven Wonders of the World by the American Society of Civil Engineers. The iconic landmark was built by Canadian National to serve telecommunication needs and demonstrate Canadian industrial strength. The tower’s height is 553.33 neters (1,815.4 ft) and it can actually be seen from a different country – it’s visible from the shore of Lake Ontario in New York State. Construction began on February 6, 1973, with extensive excavations at the tower base for the foundation. Once the pouring of the concrete was completed on February 22, 1974, the last thing to be added to the tower was the 102 metre (335 foot) steel broadcasting antenna, consisting of 44 pieces – the heaviest weighing 7.26 metric tonnes (8 tons). 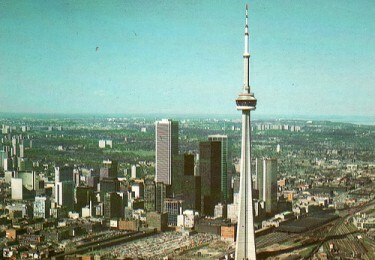 The tower officially opened June 6 1976, instantly becoming Toronto’s signature building and tourist attraction. Cost of construction: 63 million Canadian dollars, which would be $249 million in 2015. A letter from Pierre Trudeau, who also officially sealed the capsule. Letters from each of the Provincial Premiers congratulating the tower. Letters about the tower from various school children. Copies of the three daily newspapers (Toronto Star, Toronto Sun and the Globe and Mail). Canadian coins and bills of various denominations. 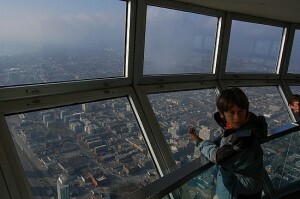 “To The Top”, the video about the construction of the tower. The capsule will be opened in 2076.